The signing ceremony of MOU between UNIST and KIOST took place at UNIST on Friday, May 26, 2017. The signing ceremony of MOU between UNIST and KIOST took place on Friday, May 26, 2017. 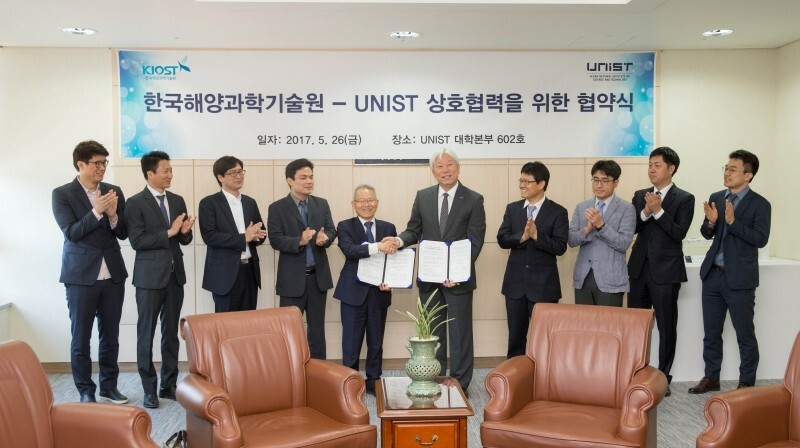 On May 26, UNIST signed a Memorandum of Understanding (MoU) with Korea Institute of Ocean Science & Technology (KIOST) to pledge mutual support for one another in the pursuit of excellence in the commercialization of seawater batteries. 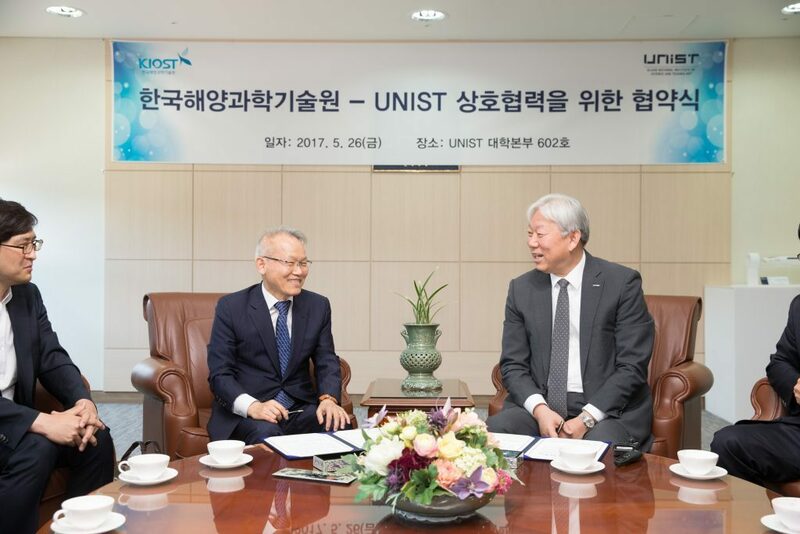 In the memorandum of understanding, the two organizations promised to collaborate on the development of a range of application technologies for seawater batteries using UNIST’s seawater bettery technology. Seawater batteries use sodium, the sixth-most abundant element on earth, to generate electricity, which makes this system an attractive supplement to existing battery technologies. This type of batteries are much cheaper to produce and more environmentally friendly than the existing lithium-ion batteries. Moreover, they also use seawater for thermal control, which may reduce the risk of fire or explosion. President Gi-Hoon Hong (left) at KIOST and President Mooyoung Jung (right) of UNIST are shaking hands at the signing ceremony for cooperation MoU. Under this partnership, both organizations will undertake the joint research on the possible applications of seawater batteries ranging from ‘buoys’, the traffic signs of the water to ‘auxiliary power’ in boats. The lithium-ion batteries, used to light the buoys break down frequently due to flooding problems and this can be solved with seawater batteries. “The potential of seawater batteries is almost infinite,” says President Mooyoung Jung of UNIST. “Through this partnership, UNIST will make a substantial contribution to the people’s lives and the development of the nation’s economy”. Meanwhile, with the Ministry of Science, ICT and Future Planning (MSIP) and the city of Ulsan, UNIST has acquired the world’s first fundamental technology to produce seawater batteries. Earlier this year, UNIST has also signed a MoU with KEPCO and EWP to initiate the joint research on the commercialization of eco-friendly seawater batteries. Through the excellent technical capacity of seawater batteries, UNIST hopes to enter overseas market.